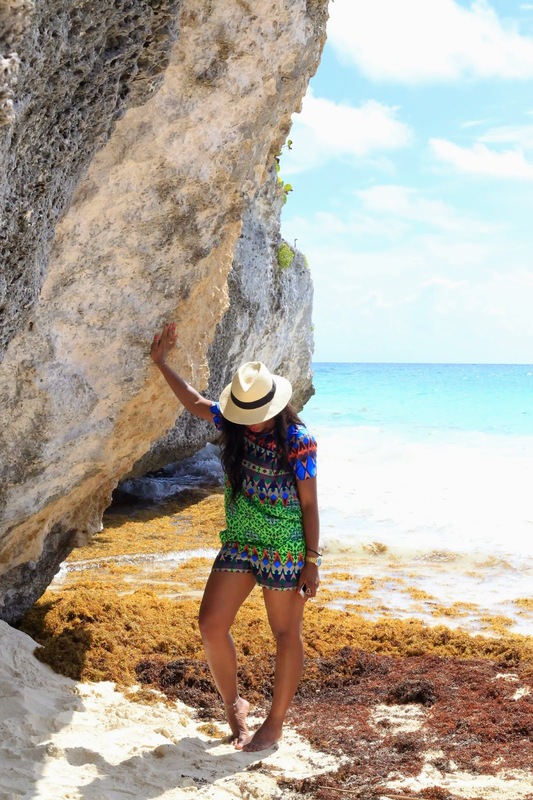 Prior to visiting Mexico, I heard so many great things about what Tulum had to offer i.e. the ruins and beaches. A couple of days after our arrival at Playa del Carmen, we went on a day tour of Tulum, which was about an hour from our hotel -Paradisus Playa del Carmen. The Tulum ruins are the most important archaeological sites in the Quintana Roo State. They overlook the beach including the giant pyramid-shaped Castillo. The architecture resembles that of Chichen Itza, which we also visited. Our tour guide took us to the pyramids and later, we went to the beautiful beach. I definitely recommend a visit to Tulum so you too can experience the history of the Mayans. Wow! what a beautiful location and nice historical details. So loving your outfit, isn't that top super fab! I got it on a major steal and wore it during a family vacation as well. Really like your pairing with the matching shorts. Hope you enjoyed your trip to Mexico, i would love to visit there some day. Amazing shots, especially the picture with the shades. I love your matching set and the beach looks so good. Beautiful pictures! Looovvee your outfit!